This simple recipe can turn an otherwise dull meal into something really special. It's perfect for company and looks as though you spent hours in the kitchen. It takes only a few minute to put together and your family will think you've been taking cooking classes. CLICK ON THE PHOTO TO ENLARGE AND SEE DETAIL. Zucchini squash is very low in calories. In fact, 1/2 of a medium (5 oz) zucchini has only 20 calories and NO FAT. When you're picking out zucchini at the store, look for ones with the darkest skin. These have more nutrients (magnesium, vitamin A, copper, phosphorus, riboflavin, and folates). The nutrients are in the skin so wash them well but DO NOT PEEL them. Zucchini - if they are large then one will feed two people. If you're buying the mini zucchinis you'll want more per person. Simmer the zucchini in one inch of salted water in a covered pan for 7 minutes. While the zucchini is simmering, blend the chopped onion, parsley, grated Parmesan, bread crumbs, and beaten egg in a bowl. Using tongs, gently transfer the tender squash to your cutting board. Using a spoon, carefully scoop out the flesh. Chop the flesh and add it to the bowl with the other ingredients. Loosely fill the empty zucchini shells. Do not pack tightly. Sprinkle with the additional 1/4 cup Parmesan cheese. Bake on foil or parchment lined pan in a 350F oven for 30 minutes or until the cheese turns a light golden brown. Serve and enjoy the compliments! You're going to love this. I just wanted to commend you on your stuffed zucchini recipe. I've never cooked w/zucchini before and I've only eaten it a few times. I tried this recipe and LOVED it: and my housemates loved it too!! I looked at so many recipes 4 stuffed zucchini but wanted something simple but elegant looking too, and your recipe is a perfect balance between the two. This is one of the few all vegetarian dishes that I didn't feel like I had to have some type of meat with, it's so good on its own! It tasted so wonderful, who would have known that breadcrumbs, egg, zucchini pulp and onion would be so good!! lol I didn't have parsley so I didn't use that, and I used red onion (I just went with what I had in my kitchen already). I also put a little cheddar cheese on top, and a little bit of grated zucchini as well (I made zucchini bread as well and had a little grated zucchini left over, and it made for a nice presentation.). I would like to send you a picture of it, if that's possible. 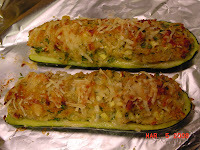 I WILL be making this again, and recommending it to anyone I know who wants a stuffed zucchini recipe! Thanks so much for not keeping your great tips and dishes to yourself, and sharing them with other cooks around the world!! I love this blog spot you have created! Oy vey would all three of those gorgeous woman in your life be proud of you! I know that Carly and myself are extremely proud. You inspire me Barbara and I am humbled by the experience of your spot in the internet world. Man I need to get off my "tuchas" and do something! I just made 3 poached salmon halves for a baby naming. I have an entire side left over. Can this be frozen? The fish was extremely fresh when I bought it so it's never been frozen. Yes, You can freeze the cooked salmon. To speed up defrosting time divide into portion sizes you are likely to use. Thank you for you question and comments. it's been a long time since i heard the word balaboosta, love it. great recipes, good looking web page. i found your web by accident and now it is in my favorites; i will use your recipes to impress my family for passover dinner. Hi. This website is so sad it almost made me cry. I, too, live in the modern world, and I continue to live my life according to the Torah, just as your bubbes and zeidies did. The Torah is as beautiful as it is ageless. I deeply hope that one day you will find the deeper meaning of Judaism, one that has nothing to do with matzohballs and the like. (My mother-in-law never made matzohballs in her life, being Libyan, but a better balabusta you never saw.) May G-d bless you and bring you home to your people. I love your blog. Made the sugar free banana cake. I didn't have a tube pan so I made half a recipe in a 13x9 and just added chopped walnuts. It was delicious! Do you have a sugar free mandel bread recipe? Thank you so much for writing and thanks also for your compliments. I am so glad your Sugar Free Banana Cake turned out well for you. That is one of my daughter's favorites. I also like it with walnuts. In answer to your question... Yes, I do make Sugar Free Mandel Bread (Broit) and I will make a point of posting it soon. Please make yourself a "follower" of Be A Balaboosta so you will get notification when I have posted something new. Thanks for the great recipes. I cannot wait to try the butter chicken! I love your Web site! I've been experimenting with dessert ideas for passover and yours have been a hit with my focus group, ie. my niece and nephews. Do you sell any baked goods or do any catering or anything like that? It seems like a natural fit, and the site is so professional! Thank you for taking the time to post your comment. And thank you for your lovely compliments. My mother died in September 2007 and within days I had started Be A Balaboosta. It gave, and still gives me comfort to share something that was so central to both my mom's and my life. I make and give my baked goods as holiday gifts and I have supplied the baked goods for many parties. I have not yet packaged nor sold anything in a retail setting though I have given it much thought. I appreciate your question as it may serve to inspire me to revisit those possibilities. Your input can help me identify areas of weakness. Which recipes have you tried? Which did your family enjoy most? Did you have any problems following my instructions and did you find any errors? Just popped your rhubarb strawberry crisp in the oven and can't wait to try it. I'm diabetic so appreciate the sugar free and whole wheat twist on a classic. Is there any way to get the nutritional information on your recipes? Thank you for the BBQ butterflied pork loin - got rave reviews from friends last night. so moist. excellent. paired it with a spiced rhubarb chutney which is one of my 'hot' recipes. Magnificent. So glad I found your page. Just starting to get zucchini in the garden and it looks like you have good recipes to try for using them up. Dear Balaboosta, I am also balaboosta, atleast when my father was alive he would call me his little balaboosta, at the age of 15 I took over the kitchen after my mother had passed away. I learned a lot of my grandmother Mollie Schwartz and my Aunt Bea & aunt Esther. I now live in California with my husband. I have one beautiful daughter and three beautiful grandchildren. I have past down a lot of family recipes to them. My grandmother came from a Hungarian background and she made this soup with pinto beans and dough. we used to refer to it as mud soup. well to make a long story short, I never learned how to make that soup and my brother has been nagging me for years to find a recipe. I was wondering if you have any idea as to what I am talking about. It was called chipla and bugla(I know I am not spelling it correctly). I was hoping that maybe you know what I am talking about. I have read several of your recipes and also made some and love whatever I have made. Especially Nana's Rice Pudding. I would love to hear from you or anyone that knows about this recipe.